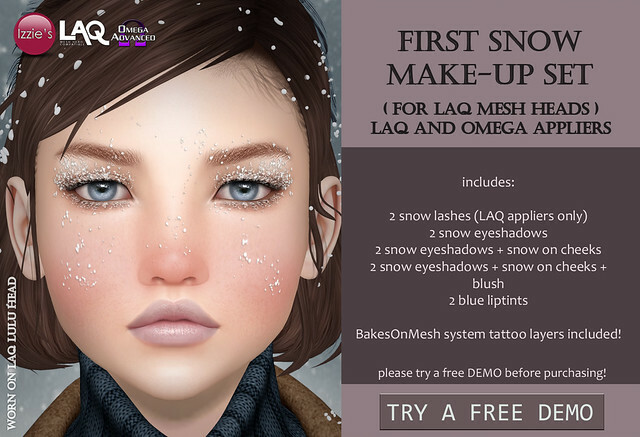 Izzie’s released a First Snow Make-Up Set for LAQ mesh heads at the mainstore and on Marketplace. This set has already been released for Catwa and LeLutka heads before, after many requests I now made a version for LAQ too. The set includes LAQ appliers, Omega appliers and BakesOnMesh system tattoo layers. The lashes come as LAQ appliers ONLY since they won’t work on any other mesh head. The Omega appliers will technically work on all Omega compatible mesh heads, but please try a free DEMO to make sure they look fine for you. The set includes snow lashes, snow eyeshadows, snow eyeshadows + snow on cheeks, snow eyeshadows + snow on cheeks + blush and blue liptint. Izzie’s is offering First Snow Make-Up Sets for Catwa and LeLutka Bento mesh heads at TLC. You get snow lashes, snow eyeshadows, snow eyeshadows + snow on cheeks, snow eyeshadows + snow on cheeks + blush and blue liptint. Please try a free demo before purchasing – there are demos at Izzie’s mainstore as well! Izzie’s is offering Face Snow and Sick Face make-up at the Tannenbaum Holiday Market. Both sets include appliers for Catwa, LAQ/Omega, LOGO/Omega, LeLutka and system tattoo layers for classic avatars. 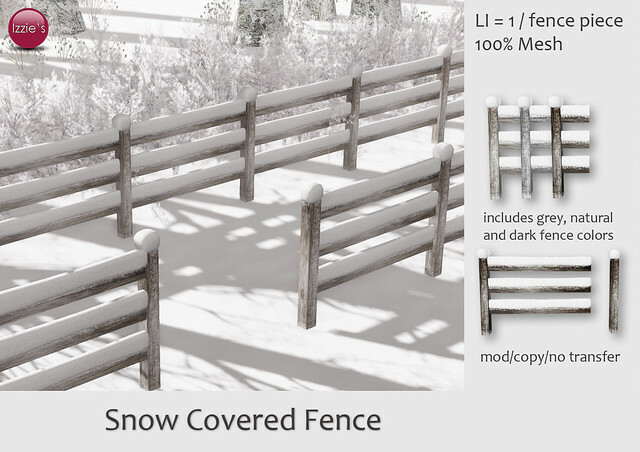 The Face Snow includes snow lashes appliers for Catwa and regular snow mesh lashes. A snow mesh layer covering your cheeks and nose to be used with LAQ and LeLutka heads (but can be worn with any other head as well). The snow comes in different styles with and without blush versions and dry lips in different shades. The Sick Face includes sore nose, runny nose, dry lips in different shades, eye redness, herpes and very sick face make-up in different shades witch and without blush and frown lines. LAQ and LeLutka appliers have less options and come without sore/runny nose! You’ll find a more detailed description of what’s included for each head in the info NC when you try the demos. Please try free demos before purchasing to make sure they work for you! 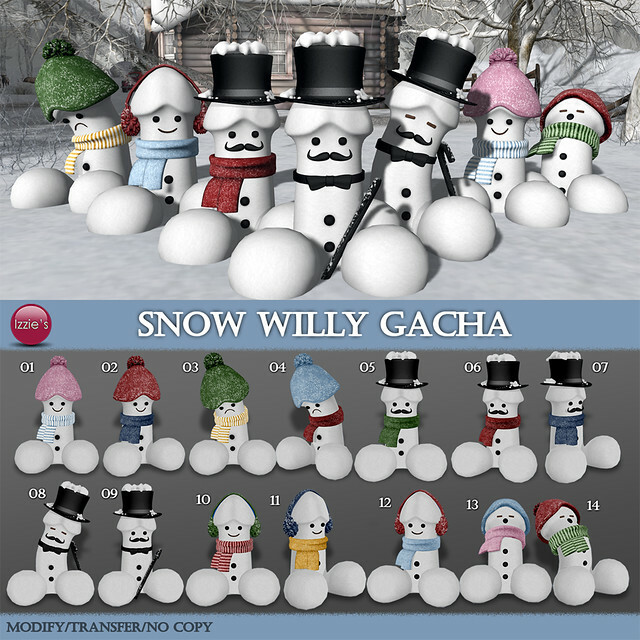 Izzie’s released a Snow Willy Gacha at the mainstore containing happy Willy, Sad Willy, Fancy Willy and Sleepy Willy in different hat versions and color versions. The machine includes 14 items, which are all commons, no rares. LI = 2-3. This gacha will also be available at Winter Trend Fair, that starts tomorrow.